In his address to the Vidhan Sabha, Punjab Governor Shivraj V Patil today said that the state government had always ensured the best law and order situation in the country. He highlighted the recent demands of the state on a Rs 5,000 crore package for crop diversification, compensation for losses on account of flight of capital to neighbouring states because of concessions granted to them and the need to give states a free hand to choose and finance their development priorities. The Governor said the state would provide free computer tablets to all 1.5 lakh students of Class XII at a cost of Rs 110 crore in the coming year. He said the government was committed to creating 10 lakh jobs in the next five years, two lakh in the government sector. The SAD-BJP and the Congress today decided to give a quiet burial to the controversy regarding the use of expletives by Revenue Minister Bikram Majithia against Congress legislator Rana Gurjit on the floor of the House during the last session. At the Ludhiana Municipal Corporation general house meeting tomorrow, the issue of supplying local residents treated water from the Sirhind canal will be discussed. The issue has been hotly debated as the underground water of the city has been depleting fast. The proposal to supply canal water to cities is not new to the state as Bathinda and some other districts already have similar mechanisms in place. Punjab continues to paint a grim picture so far as the growth rate of its Gross State Domestic Product (GSDP) is concerned. Among the big non-special category states, Punjab is a laggard. That Punjab is a major transit point for drugs to the US and Canada has been re-affirmed with the busting of yet another drug ring allegedly involving policemen and sportspersons. Farmers of five villages in this border district have devised a strange technique to get rid of the menace. They have been using live electricity wires around their fields to kill these animals. Their population has grown alarmingly in the area over the last few years. The Supreme Court today directed Punjab’s Director-General of Police (DGP) and the Tarn Taran district police chief to file their reports within a week on policemen thrashing a woman on March 4 when she approached them to lodge a complaint of sexual harassment against truck/taxi drivers. Punjab State Electricity Regulatory Commission (PSERC) has directed the Punjab State Power Corporation Limited (PSPCL) to aggressively implement the fuel audit report at all its thermal plants. The commission had disposed off the review petition filed by the PSPCL. It contested the PSERC order of October 10, 2012 regarding the compulsory fuel audit of various thermal power plants. Nine farmers arrested in connection with the death of Assistant Sub-Inspector Kulbir Singh were today sent to two-week judicial custody till March 25. One more farmer held in the case earlier is already in judicial custody. Former MLA Sukhpal Singh Khaira and Punjab Youth Congress president Vikramjit Singh Chaudhary today hit out at the state government for withdrawing bulk of their security cover. The encroachment along the wall of the local Prem Sabha Senior Secondary School has not been removed even though the school had threatened to protest against the administration on March 4 if it failed to take any action. Former Punjab BJP Mahila Morcha chief Vijay Laxmi Bhadoo has been again made the chairperson of the Punjab Social Welfare Board. Bhadoo had quit the post last year to contest the Vidhan Sabha election from Abohar, which she lost. Activists of the Bharatiya Kisan Union (Ugrahan) today burnt effigies of the state government at Bhutal Khurd and Chottian villages (near Lehragaga). They also held demonstrations and raised slogans against the government in protest against the arrest of agitating farmers in the past few days. The Punjab and Haryana High Court today directed Ludhiana Commissioner of Police to give Shiromani Khalsa Panchayat president Charanjit Singh Channi notice three days in advance after taking cognisance of the fact that he was acquitted in eight cases. These cases were registered against him due to political vendetta. A 32-year-old drug addict, Harshjeet Singh, resident of Flound Kalan village (near Malerkotla), today allegedly committed suicide by jumping from the second storey of the civil hospital here. He was admitted to the local civil hospital on March 4. A Dhuri-based private drug de-addiction centre had referred him to the hospital. Two years after her mother went missing, a 15-year-old Dalit girl was allegedly abducted by some unknown persons from a Moga village last night. A case has been registered at the Mehna police station against unknown persons. The Governor lamented that Chandigarh had not been transferred to Punjab despite a “sacred commitment” in Parliament in 1985. He demanded that Chandigarh as well as Punjabi-speaking areas be transferred to the state immediately. He cited the ‘inhuman’ massacre of innocent Sikhs in Delhi in 1984 and called for exemplary punishment to the guilty and comprehensive relief for the families of the victims. Patil said the government was opposed to a national river water policy that violated the riparian principle, adding that the state had been meted out grave injustice on the issue. The Governor said the people in the state were convinced of the sincerity of purpose of the government and, hence, had given a resounding verdict in its favour in the recent Moga byelection. He said the victory was not an exception as the SAD-BJP alliance had registered a thumping win in the Dasuya byelection earlier. He said owing to the people’s faith in the policies and programmes of the alliance, it had also turned victorious in the Delhi Sikh Gurdwara Management Committee (DSMC) elections. The Governor refused to own the government while reading out the Address. The words “my government” came up more than 35 times in the 55-page speech. He replaced these each time with “the government”. 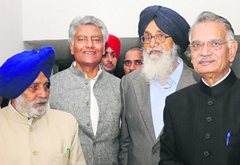 He refused to end the Address by lavishing praise on Chief Minister Parkash Singh Badal. He did not read out the sentence “It is the great fortune of my state that in this great march, it is spearheaded by one of the tallest statesmen of the country in living history and a visionary of iconic stature, S Parkash Singh Badal” in full form. He not only cut short the epithets, but also introduced his own, stating “it is spearheaded by one of the most mature statesmen of the country". 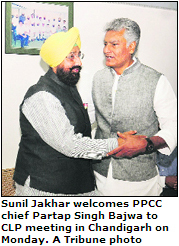 When the new PPCC president, Partap Singh Bajwa, entered the assembly, Congress MLAs greeted him with the thumping of desks. "We welcome you to the House," said the Chief Minister. 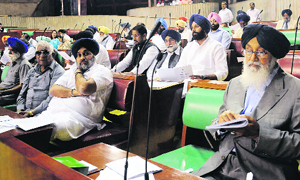 Revenue Minister Bikram Majithia sat behind Deputy CM Sukhbir Badal. He usually occupies the seat in the front row. A young Congress legislator remarked: " The two Badals, senior as well as junior, will now be able to keep the rebel under control". Certain bureaucrats in the visitors' gallery did not stand up for the national anthem at the end of the day's proceedings. An officer said: "The anthem was meant only for those directly concerned with the conduct of the House affairs." But a colleague of his pointed out that information on the MHA website clearly stated that whenever the anthem was sung/played, the "audience shall stand to attention." Governor’s Address noted that revenue from VAT and CST (central sales tax) had increased from Rs 11,227 crore to Rs 13,387 crore up to February 2013. It said excise collections were likely to increase by 25 per cent to Rs 3,400 crore. The excise collections were targeted at Rs 4,000 crore, an increase of Rs 600 crore over last year. Strangely, the Governor was quoted as saying “my government has been performing well on the fiscal front despite the growing committed expenditure.” This despite the fact that the government has fallen short on all benchmarks in this sector. Governor’s Address mentioned that the size of the Annual Plan had been tentatively finalised at Rs 92,000 crore for 2012-13 to 2016-17. The outlay for the current year (2012-13) had been fixed at Rs 14,000 crore and the state was likely to achieve its targets. This claim has been made despite the fact that the state has been able to achieve only 49 per cent of the Plan. Joginder Pal Jain, who was elected from the Moga constituency, was administered the oath of office and secrecy by Speaker Charanjit Singh Atwal at his chamber. Before the session began today, a three-member committee comprising Speaker Charanjit Singh Atwal, Chief Minister Parkash Singh Badal and Congress Legislature Party Leader Sunil Jakhar met Majithia and Rana Gurjit. The Chief Minister, when questioned, said the issue had been resolved and if needed, he would express regret over the unsavoury incident. The sources said it had been decided that the CM would make a statement on the issue on March 13. Decrying the incident as unfortunate, he would inform the House that both Majithia and Rana Gurjit had resolved their differences. The sources said both the SAD and the Congress had decided to give a quiet burial to the episode to ensure a smooth Budget session. The CLP Leader was keen that the Congress took up people’s issues and accordingly the party had decided not to insist on an apology from the Revenue Minister. There was a debate on the Majithia-Rana fracas at a CLP meeting where a section of legislators insisted that Majithia be asked to apologise. Pradesh Congress president Partap Bajwa asked Rana Gurjit whether he had abused Majithia first, to which Rana reportedly replied in the affirmative. However, he said he would not tender an apology. This unsettled Congress MLAs who felt the party did not have any moral ground to continue to disrupt the assembly proceedings on the issue. There is a feeling in political circles that Majithia’s image received a boost in the Majha region following the assembly fracas. In contrast, Rana’s reputation as a strongman has taken a beating. The latter wanted to correct this impression by openly admitting he had abused Majithia, said sources. In December, last year, a team from Indian Institute of Technology (IIT), Roorkee, had visited the city to check the feasibility of the project. The experts gave it a green signal and now the MC was planning to give formal shape to the proposal. The proposal was first discussed on September 19, last year, at a meeting chaired by Major General VK Bhat, head of the Technical Advisory Group under the Punjab Urban Development Mission. An MC official said 80 per cent of the total water supplied by the MC went into the sewerage system. “Residents are wasting precious water. This needs to be checked,” he said. Suresh Chandra, former chief engineer of Uttar Pradesh Jal Nigam, said there was enough water in the canal to be supplied to the city. He was also the member of the IIT team that had visited the Sirhind canal near Neelon village. “The canal water is cleaner than the ground water. The project is also cost effective. If treated properly, the water is fit for drinking,” Chandra had said. If everything goes as planned, the Ludhiana Municipal Corporation will construct underground reservoirs at Nehru Rose Garden in Civil Lines, Mini Rose Garden in Kidwai Nagar and a park near Cheema Chowk to supply water from the canal to residents. A treatment plant to clean the water will be set up at the Sirhind canal near Doraha. The water will be brought to the city through a 22-km underground pipeline. Though against the growth rate target of 5.9 per cent, fixed for the state in the 11th Five-year Plan (2007-08 to 2011-12), the state has achieved 6.87 per cent growth, it is the lowest among the 17 big states like Bihar, Chhattisgarh, Haryana, Odisha, Tamil Nadu, Uttar Pradesh and West Bengal. The country’s overall growth during this period has been 8 per cent against the target of 9 per cent. Punjab has registered significantly poor growth on the agriculture front, also called the primary sector. The predominantly agriculture state has registered a growth of 1.89 per cent in the farm sector against the national figure of 3.5 per cent during the Plan period. Available advance estimates indicate that the state’s overall growth will be 5.2 per cent this fiscal year (2012-13), which is about to close. The state is likely to register a negative growth (minus 0.34) in the primary sector, which comprises agriculture and allied activities. Growth in manufacturing sector (secondary sector) has been estimated 3.54 per cent and in services sector 8.95 per cent. While measuring growth in the primary sector, farm production, minimum support price, area covered under agriculture and inflation rate are taken into account. The state’s GSDP has been growing slow as compared to most of the other states since the beginning of the Eighth Plan (1992-93). Figures released by the Planning Commission indicate the state grew at the rate of 4.7 per cent during the Eighth Plan, 4.4 per cent during the Ninth Plan, 4.5 per cent during the 10th Plan and 6.87 per cent during the 11th Plan. Compared to it, Gujarat grew at a rate of 12.4 per cent during the Eighth Plan, 4 per cent during the Ninth Plan, 10.6 per cent during the 10th Plan and 9.59 per cent during the 11th Plan. 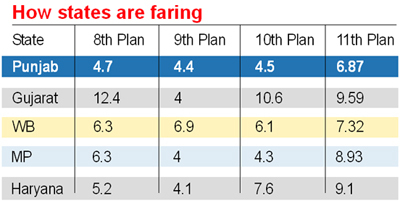 During the 11th Plan, Bihar’s growth of 12.11 per cent was the highest and Gujarat’s second highest in the country. Andhra Pradesh grew at the rate of 8.33 per cent, Chhattisgarh 8.44 per cent, Haryana 9.10 per cent, Jharkhand 7.27 per cent, Karnataka 8.04 per cent, Madhya Pradesh 8.93 per cent, Tamil Nadu 8.32 per cent and West Bengal 7.32 per cent. Against the national growth target of 8 per cent, Punjab has been given the target of 6.5 per cent during the 12th Plan (2012-17). Per capita income in the state (on the basis of current prices) is expected to be Rs 89,345 registering an increase of 14.54 per cent over the last year’s Rs 78,594. Earlier too the Punjab Police, the Directorate of Revenue Intelligence (DRI) and the counter-intelligence wing of the state police along with the Delhi police collectively busted several groups involved in the racket. However, investigations in most cases reached a dead end. A drug carrier or his leader usually do not know about the kingpin. Hence, their arrest provides no leads and the investigation hits a dead end. Informed sources said that peddlers in the past have used religious leaders and books for smuggling drugs to western countries from Punjab. The World Drug Report 2006 was the first to mention Punjab as the transit point for narcotics, stating that heroin and opium from Afghanistan and Pakistan reached Punjab via its borders with Pakistan or from Jammu and Kashmir. In Ludhiana, the drugs were not only stored but also purified to make drugs like Ecstasy, which is used in rave parties. Though the then state police chief dismissed the UN report as false, the Delhi police busted an international syndicate with the arrest of Toronto-based Gurdish Singh Toor alias Amarjeet Singh from Ludhiana. In 2008, Head Constable Rachan Singh, a kabaddi player with 70 medals in national and international tournaments to his credit, was arrested for hobnobbing with smugglers. He had been specially deployed with the counter-intelligence unit of the state police to nab the smugglers. The policeman owned a Ford Endeavour, a Skoda Octavia and two Lancer cars. A Canadian NRI, Arvinder Singh, and two others were also caught with the policeman. Though the act is illegal under the law, the villagers say they have no other option. “We approached the wildlife authorities several times, but they failed to work out any concrete plan to keep the boars at bay,” says a farmer. These five villages — Mandiala, Bohru, Mannan, Khair-De and Pandoori — are located adjacent to Rakh Bohru, a forest reserve spread over 234.8 hectares, which is home to these boars. These animals normally move towards agricultural fields at night. In 2006, the state government had allowed the killing of wild boars that strayed into fields. But, a prior permit from the Forest Department was a must. Seven years down the line, there are no takers for the government’s rescue plan. Farmers claim the process of acquiring a permit is too cumbersome. They point out that not even a single farmer from their area has so far applied for a permit. The rules were simplified in 2009 and then again in 2010, but that also did not serve any purpose. The law allows killing of boars only with a 9mm gun. The permit seeker is also required to deposit the animal’s body and give justification for its killing to the officials of Forest Department, which, most farmers claim, is “uncalled for”. Sub-Divisional Magistrates are the nodal authorities for the permits. However, that does not mean that the farmers have never brought the matter to the notice of district administration or the Forest Department, say villagers. “We have been frequently raising the matter with the quarters concerned. 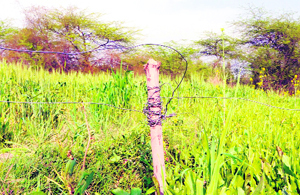 Erecting a barbed fence around the forest reserve to prevent boars from moving out can serve the purpose, but the government is silent on the proposal,” says another farmer, Surmel Singh. Divisional Forest Officer NS Randhawa admits that the problem of boars is “really serious”. “We have sent a proposal for fencing the forest area. The work will be started once we get the required sanction and funding,” he says. The live-wire method too, say farmers, is not that effective. They say the erratic power supply has taken the sting out of their “novel technique”. “Power supply during the night in rural areas is not for more than three hours. So, boars often damage the wires when current is not flowing in them,” says Gurpreet Singh, a villager. Not only crops, there have been instances when wild boars have attacked villagers. “We are afraid of going to our fields at night. Boars destroy more than they eat and it is very risky to challenge them when they are on the fields,” says another farmer. Not only Tarn Taran, farmers in Mukerian, Dasuya, Garhshankar, Balachaur, Ludhiana, Dhar, Pathankot, Dera Baba Nanak, Ropar, Anandpur Sahib, Kharar, Ajnala and Patti too have been facing the menace of wild boars for years together. “Was that lady a terrorist to be beaten up on the highway,” a Bench comprising GS Singhvi and Joseph Kurian asked Additional Advocate-General Ajay Bansal. Bansal said the state government had ordered a magisterial inquiry and the report would be available in 21 days. The Bench said if the government had been serious on the issue, it would have taken stern steps within 24 hours, thereby sending out a warning to other policemen. The Bench was also not convinced by the fact that two of the policemen involved in beating up the 22-year-old woman and her father had been suspended. “After three months, they will be reinstated and rewarded for bravery,” the Bench remarked. There was a need for fixing responsibility at a higher level, it said. The Bench also said the state government was, perhaps, ordering magisterial inquiries in order to give a burial to such incidents. It observed the Punjab Police had acquired a “particular mindset” while fighting terrorism in the 1980s and this was still continuing with it. Attorney General GE Vahanvati, who has been asked by the Bench to assist the court on constitutional issues involved in the incident, said such incidents had serious ramifications as, henceforth, people would be scared to approach the police for lodging complaints against perpetrators of crime. Describing the victim as a “braveheart,” the Bench said she did a wise thing by running away from the lathi-wielding policemen. The SC has taken suo motu notice of the Tarn Taran incident along with a similar police action against contractual teachers demonstrating outside the state assembly at Patna on March 5. Pointing out that both the Tarn Taran and Patna incidents undermined people’s right to life, liberty and dignity, the Bench said these were not isolated happenings. “Such incidents are frequently happening in different parts of the country,” the SC remarked. The Bench enlarged the scope of the suo motu PIL and issued notices to the Centre and all the states and union territories, seeking details on the implementation of apex court guidelines on police reforms issued in a case filed by former Uttar Pradesh DGP Prakash Singh. The Bench will hear the case again on April 1. The commission in its recent orders observed that PSPCL instead of objecting to the various findings of the Central Power Research Institute (CPRI) report, should effectively implement it to improve its financial condition. It further said the PSPCL should reduce the cost of generation. The main objective behind the implementation of the audit is to improve the system set in place to find out the Gross Calorific Value (GCV) of coal. Commission noted that the fuel audit said there should not be more than 150 kcal/kg loss between the “coal as received” and “coal as fired”. Since this norm was fixed, the GCV had come down significantly but not to the desired level, the commission said. This loss is due to the fact that between the time when the coal is received and burnt, which is generally after a month, the weight of the coal decreases due to loss in moisture level. The order further reads that the GCV at Ropar thermal plant came down from 555 kcal/kg in November 2012 to 360 kcal/kg in January 2013 ever since the fuel audit report has been in the process of implementation. At Lehra Mohabatt Thermal plant, the corresponding drop has been 100 kcal/kg in the recent time. The commission in its Tariff Order 2012-13 has only laid down that the drop in GCV of coal "as received" and "as fired" should be around 150 kcal/kg. The commission in its Tariff Order 2012-13 has also provided Rs 858 lakh for additional facilities/infrastructure at PSPCL thermal plants to reduce fuel cost. It directed the PSPCL to implement these measures for the benefit of the consumers. If the fuel audit report is implemented, the PSPCL can save up to Rs 306 crore annually. In another development, the head of the three-member board that conducted the post-mortem, Dr Inder Mohan Gupta, has maintained that there were no visible injury marks on the dead police officer’s body that hinted towards any thrashing. Though the post-mortem report is awaited, Dr Gupta’s assertion belies the police’s claim that the accused, during interrogation, admitted to manhandling the ASI, which led to his death. The police had initially booked the farmers under Section 304 of the IPC. But after the interrogation of the accused, it converted the FIR into Section 302 of the IPC. While the police is continuing its manhunt to nab other accused in the case, various farmer organisations have flayed the move. They alleged that the police was adopting a repressive approach so as to restrain the farming community from taking to the path of protest. Kisan Sangharsh Committee state president Satnam Singh Pannu has condemned the registration of a case against the farmers under Section 302 of the Indian Penal Code (IPC). He demanded withdrawal of the “false” case and unconditional release of the farmers. The farmer bodies is now gearing up to stage a dharna in support of its demands outside the Deputy Commissioner’s Office here on March 18. Meanwhile, security has been tightened in Tarn Taran and Amritsar in view of the threats by the farmer organisations to intensify their agitation in order to pressurise the government for the withdrawal of murder charge slapped on several farmers. Speaking to mediapersons after the conclusion of the Governor’s speech on the opening day of the Budget Session of the Punjab Assembly today, both the leaders alleged that they had been selectively targeted for aggressively taking on the Akalis. Khaira said he had earned the ire of a former ruling party minister who had, at one point of time, publicly asked her workers to throw acid on him. Chaudhary said his security had been trimmed as he had demanded removal of the posters of Chief Minister Parkash Singh Badal from 108 ambulances. A former MLA from Bholath, Khaira sought a justification from the government as to why several SAD ministers, including Revenue Minister Bikram Singh Majithia, had 20 to 25 security personnel “despite their name not being in the threat category”. Chaudhary pointed out that there were SAD leaders who had lost the previous elections but they continued to enjoy heavy security. “The police has no satisfactory answer to the changed security scenario. The entire exercise is politically motivated and aimed at settling personal scores,” Chaudhary said. “We challenge the government to withdraw even the minimal security that has been left with us. We are virtually left to fend for ourselves and are contemplating legal action,” Khaira said. A deputation of 22 female teachers from the school had given the ultimatum to the Deputy Commissioner (DC), said PC Jain, secretary of the school management committee. They demanded that the illegal stairs leading to the school and the housing board colony nearby be removed within seven days’ time or face agitation. Teachers also said the stairs were a major obstacle to those students who cycled to school everyday. Most of them inadvertently got late due to this, they said. Jain said even Finance Minister Parminder Singh Dhindsa had written to the DC to look into the matter but no action had been taken so far. Earlier, on March 4 the DC had asked the Sangrur Sub Divisional Magistrate (SDM) to examine the case and submit his report within three days to find a workable solution. DC Kumar Rahul today said the SDM would submit his report to him the next day. Thereafter, requisite proceedings would be initiated, he added. Hundreds of women greeted her at the Community Centre here as the state and central social welfare boards jointly celebrated the International Women’s Day on Monday. Bhadoo said her priority will be to clear all pending cases before the month-end to ensure the available grants were utilised fully. She also distributed beauty kits to 31 trainees doing a beautician course and scholarships to computer trainees under a programme co-sponsored by Mahila Raksha Samiti, which is founded by her. The farmers at Chottian village were led by district organising secretary of the union Bahadur Singh. At Bhutal Khurd village, the activists held a protest under the leadership of local leader Sukhdev Sharma. The notice is to be given in case Channi is required to be arrested in any matter having “party faction connotations”. The directions by Justice Jitendra Chauhan came on a petition filed by Channi against the State of Punjab and other respondents. He was seeking the issuance of notice seven days in advance, “in case he or any of his family was required to be called in connection with any case”. Directions were also sought to the police to protect their life and liberty and not to harass the petitioner. His counsel contended that Channi was “falsely involved in a large number of FIRs”; and was being harassed on “account of factionalism in the party”. In its written statement, the State on the other hand alleged that the petitioner was a habitual offender and was involved in more than 10 FIRs. Taking up the matter, Justice Chauhan asserted that it emerged from the record that the petitioner was acquitted in “first eight” FIRs. Justice Chauhan added: “The petitioner has been acquitted in eight FIRs. The State Counsel submits that no appeal has been preferred against acquittal by the State. In this background, this court feels that the apprehensions raised and the prayer of the petitioner are not prima facie ill-founded…. “This court is not inclined to go into the claims and counter-claims raised by the parties. The court is allowing the prayer for a stipulated period in view of the acquittal of the petitioner in eight cases. “This order shall remain operative for the next three months and shall be available to the petitioner only in case any fresh FIR is registered and the same is ridden with political connotations,” he said. Bir Singh, an employee in the BSNL at Malerkotla and Harshjeet Singh’s father, was informed this morning that his son had jumped from the hospital. Bir Singh complained the management of the Dhuri-based drug de-addiction centre where he had admitted his son on March 4 referred him to the Sangrur civil hospital without his knowledge. He alleged his son had been tortured and ‘beaten up’ by the staff at the de-addiction centre. Dr Balwant Singh, officiating Senior Medical Officer (SMO) at the civil hospital here, said Harshjeet Singh had been admitted to the civil hospital on March 4. Harshjeet jumped from the building at around 4.45 am, he said. A three-member board had conducted his post-mortem examination, the report of which would be available after conducting the viscera examination of the deceased, he said. Harinder Singh, Station House Officer, City, said on Bir Singh’s statement the police had registered a case under Section 306 of the IPC against Anil Kumar, owner of the Dhuri-based drug de-addiction centre. Further investigation is on. In his complaint to the police, victim’s father Mukesh Kumar, who is a waiter, said when he returned from work late last night, his daughter was not in the house. After he failed to locate her, he approached the police. He also informed the local police that the whereabouts of his wife, who had gone missing about two years ago, were still not known. He said: “The police has failed to trace my wife. I hope it will now help me get my daughter back”. The police had launched a hunt for the girl. Preliminary findings revealed that Mukesh’s wife was living with some other person. “Efforts are on to locate her. There is a possibility that the victim might have gone to her mother. We are also considering the abduction angle,” said a police officer.